The linchpin meetups are an unprecedented global sharing of creative energy and building of purposeful relationships. Sadly however, due to the laws of physics, when we interact in the real world each of us can only be at one event, and there’s only so many people any of us can talk to in a few hours. Linchpins going to attend the meet up in their home city might be just as interested in what linchpins in other cities have to teach them. 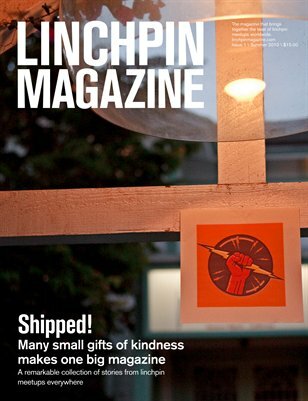 The purpose of the Linchpin Magazine therefore is to create a curated space to share ideas and experiences from the meetups, to bottle some of that creative goodness and pass it round. We want to make it into a physical publication because for us, this is art. We want to be able to hold it, touch it, scribble on it.